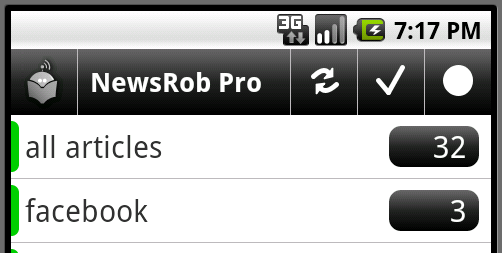 NewsRob now rated “teen” as it allows users to share comments and display user generated content. A beautiful news application that makes reading news fun and engaging. Pulse takes your favorite news websites and transforms them into a colorful and interactive mosaic. Tap on a news article to see a clean and elegant view of the story. Sharing it via Facebook, Twitter and Email is as easy as two taps. 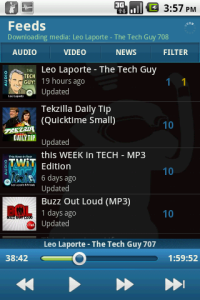 FastReader is Google Reader client for android 1.6 or later. The best feature of FeedR is built-in Feed Search. There is no need to use the Browser and copy / paste or type in long URLs. Simply enter the name of the site or any search key words and be on your way reading your feeds. Just to be sure the feed looks OK and is exactly what you wanted you can preview any feed returned by the search before you add it to your list. FeedR is built around 3 simple principles: Speed, Efficiency, Transparency. In addition to fast, responsive UI FeedR offers plenty of features that improve your feed reading efficiency. Being transparent means that we will not go overboard with effects and fancy controls — because we know that mobile real estate is precious and resources are limited. We believe it is best when the UI is virtually invisible and nothing should get in the way between you and your feeds. It’s basically an RSS reader that integrates with Google Reader. It started out as a feature in Handstand that grew to immense size and didn’t really fit with that application, so I removed it and turned it into its own application. Best podcaster. Not only does it keep your subscriptions up-to-date, but it helps you discover new shows to listen to. It extracts the text of the article and downloads the main image. Our built in media player supports features like configurable “TiVo style” commercial skip, tracking of played time, easy cleanup of played podcasts and many others. BuzzBox™ creates a personalized list of top news stories for you. It’s the best RSS News reader out there. 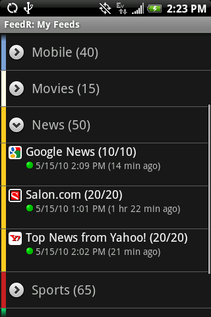 BuzzBox keeps you informed via smart alerts, is organized to quickly get informed and has cool widgets in dark/light themes.